High style needn't rely on a super-sized budget—not that $25,000 is anything to sneeze at. 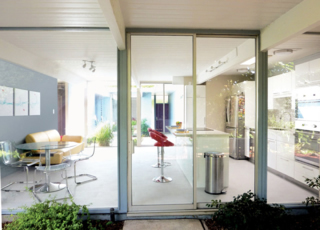 That's certainly the case for Asli Ucok and Eren Gonen's Eichler kitchen in the South Bay. 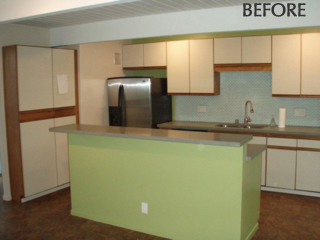 When the couple purchased the home in 2011, the kitchen was as outdated as the rest of it. "It had '80s cabinets and mismatching modern countertop," Eren says. "The appliances were old, and electrical wiring had several no-nos. Furthermore, the previous owners had dark brown flooring, which looked pretty bad." Before Asli and Eren even purchased the house, they fell in love with white cabinetry and countertops they found at IKEA. It made designing the space after closing much more straightforward. "We always wanted white cabinets," Eren says. "We like them better because they give a brighter look rather than wood." 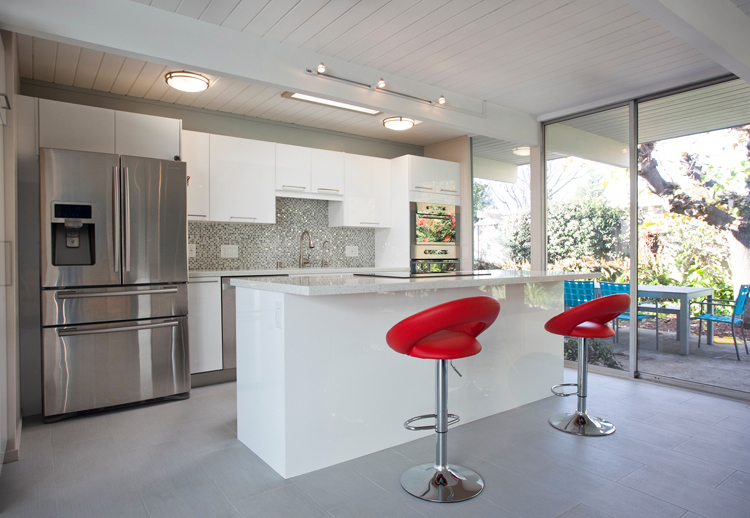 Sticking with a utilitarian galley layout in the ample kitchen space, they worked with Pellegrino Construction for installation. The basic work triangle consists of a cooktop on the center island, and a refrigerator, sink, and double ovens along the wall. Blue-gray tile on the floor complements the stainless steel and reflects the blue skies outside. 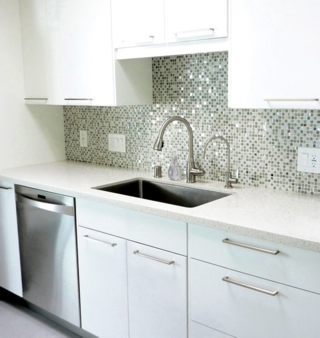 For a touch of glimmer, the couple opted for a glass-and-metal mosaic backsplash behind the sink. During construction, they discovered that despite the floor-to-ceiling windows and white cabinetry, there were still dark pockets. They added a few skylights to let in more sunshine into the space. White cabinetry opens up a world of possibility for color palettes. Asli and Eren started with a blue wall. Soon, a palette of primary colors emerged: a bold yellow sofa for lounging, red modern barstools, and coordinating art for the wall. Since the family had a formal dining area elsewhere in the house, they opted to make the kitchen more of a quick-bite and lounge space by furnishing it with a 60-inch round table paired with Lucite chairs. "From our previous experience, everyone always ends up in the kitchen, and we're seeing this with our current kitchen, too," Asli says. The family had the luxury of not moving in until after the remodel was completed. But once they got inside, they dove head first into life with a two-year-old and entertaining family and friends.